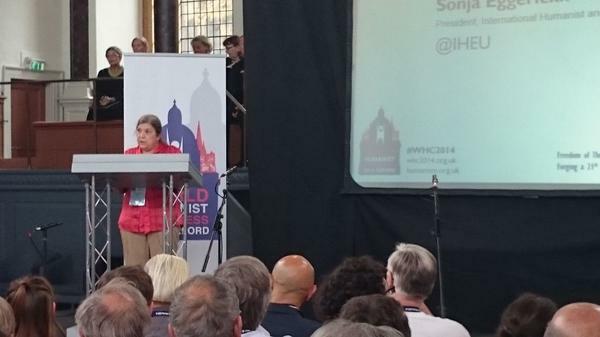 Sonja Eggerickx, the president of the International Humanist and Ethical Union (IHEU), spoke a short time ago at the plenary of the World Humanist Congress in 2014. Having opened this morning, the Congress features world-leading figures on the theme of “freedom of thought and expression”, and Sonja’s remarks emphasized the centrality of these rights to the rest of the human rights framework. Sonja’s welcome followed one of the British Humanist Association’s That’s Humanism videos voiced by Stephen Fry on Humanist values. Thank you to the British Humanist Association for that remarkable video, which I think speaks wonderfully to the common values and understanding of Humanism, by humanists, not just in the UK but around the world. And of course Stephen Fry can be seen almost everywhere on the planet so what an excellent spokesperson he is! I am Sonja Eggerickx, the president of the International Humanist and Ethical Union – I. H. E. U. or IHEU. We are the world umbrella organization of Humanist associations, and this World Humanist Congress is held under the auspices of IHEU. It is hosted every three years by a different one of our member organizations, and we are incredibly pleased to be here in Oxford with the British Humanist Association this year. 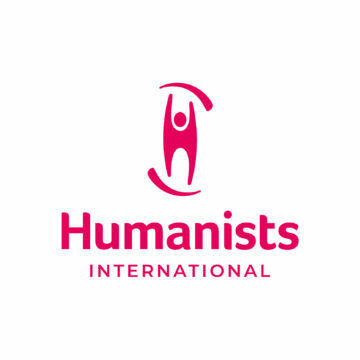 The British Humanists were one of the founding members of IHEU and have always had some of the very strongest ties with the international work that we do. There are fantastic speakers lined up from all around the world. Of course the theme of this congress is “freedom of thought and expression” and these freedoms are two distinct human rights, of course, so in the parallel sessions we’ll be hearing from experts on human rights and freedom of speech, freedom of religion or belief, as well as many other inspiring speakers, and creators, and activists. Freedom of thought and expression is truly vital to Humanism. Of course everyone in society needs these freedoms. But in particular the very articulation of Humanist ideas and values has always depended on freedom of thought and expression. Very often in history the reformers and the innovators who make the moral, social, scientific, artistic advances, and making progress toward liberty, reason, and secular democracy, were forging their achievements despite massive restrictions on their freedoms. And still today, these two rights are at the centre of the policy agenda of IHEU and the campaigning work of our member organizations. So it’s an excellent theme – we’ll be examining the implementation of our freedoms and how they work in specific areas, as well as controversies and challenges – and championing those “Enlightenment” values for the 21st century. Now, we are going to hear from the Oslo Humanist Choir. I am personally very keen, that when we come together as humanists we ensure that all the human faculties are exercised – not just our reason but our emotions and our our fellow-feeling. What better way to do that, than by listening to music? This music comes from the Oslo Humanists — and our last Congress was in Oslo three years ago — so hearing from them now represents the continuity of the International Humanist movement, a passing of the torch. So please give a very warm Oxford welcome to the Oslo Humanist Choir!